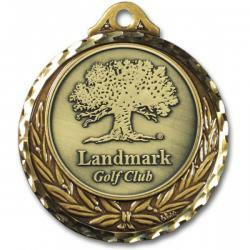 Put your logo on our wide selection of golf medals for your next golf tournament, event, outing or promotion. Custom Logo 2 3/4" Wreath Medal. Champions and participants all deserve recognition for their efforts. Show your appreciation to each player at all upcoming events with customized medals. Award those Junior's,Women's and Men's champions or flight winners .. Custom Logo 2" Corporate Golf Medals. This medal design combines the popular elements of a wreath and stars together to create an attractive and radiant award. Make great gifts for your next golf tournament. Personalization is available. Rush is.. Custom Logo 2" Full Color Golf Medals. These custom-imprinted emblems combine a classical design with a modern, photo-quality, digitally-imprinted graphic of your choice. Unlimited colors are included. Make great gifts for your next golf tournam..
Full Color Imprinted Golf Medals. Our largest and most intricately designed full color medal, guaranteed to make your logo or emblem shine in all its glory. The medal has a refined finish and a large, precision-built imprinting area. Make great .. Custom Logo Golf Tournament Medals. Designed to emphasize the imprinted art more than the medal itself, with subtle and attractive design accents that gently direct the viewers eyes to the emblem. The medal also enjoys a smooth contour, giving it a c..